Are you literally amazed by the fact that we're on our 91st episode? Too bad, because there's no such things as being "literally amazed." Still, we hope you join us as we discuss the transition between Halloween and Christmas, video game enemy design, and auxiliary music media for video games. Stick around for a ad-lib repurposing of VGM and watch as the golf world keeps pulling Josh back in. Finally, we welcome a new staff member to the VGM JUKEBOX. We are thankful for you, dear patrons, so come on in! Have you ever wondered if AI is being too nice to you? It could be that they're just trying to give you a satisfying gaming experience. On this week episode, Josh and Emily hope to be the purveyors of another satisfying listening experience as we move through some great recommendations from the sugar crystal tip to another excellent VGM Karaoke. Also featured on this week's episode, Josh and Emily talk about cyclops snuffleupagus, real time strategy games with fighting controls, fighting games designed to teach you to type, and a bunch of other totally, awesomely regular stuff. 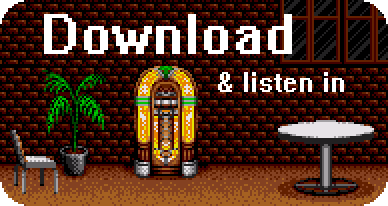 Josh and Emily are back at The Jukebox for discussions about milestones that our a couple of VGM podcasts are coming upon. They discuss renting videotapes and the existence of Blockbuster. Emily drops some knowledge about a small Alaskan town with only one tunnel into town, which has led its people to live more as one. Finally, Josh tries to elevate the human animal by telling a story about a chimpanzee he saw at the zoo. Oh, there's also a very good VGM Karaoke Rap on this one. AND ON THE LAST DAY, SOMEBODY INVENTED VGM, AND IT WAS GOOD! Josh and Emily start this episode off with a brand new segment, which has yet to be named. As they read your testimonials and listen to your recommendations, they find themselves inspired to converse about in-game nostalgia, brain-spas, sitting indian style in the middle of the playground, and that's just over the first two tracks. Emily tries to imagine the future of gaming, and whether or not she will be able to beat her grandchildren at video games. Of course, we can't tell the future, but we can sure speculate! That's just one of the things we do at the here at the VGM Jukebox! Castlevania: Symphony of the Night, "Blood Relations"